I just got my ACT and I did well on the composite (35). However, I did awfully on the writing test (5/12). I think it's because of my handwriting. Do you guys think I can go into a good college thru my writing test being carried by a composite (note: I am a freshman). Also, what can I do to improve my handwriting day of? I can't write neatly in 40 minutes normally. The "correct" grip is the dynamic tripod. Personally I can never get used to it, and am a "dynamic quadrupod" gripper. I do tire after a bit of writing though. Those last two grips look quite uncomfortable and just shy of making a fist and carving your letters. 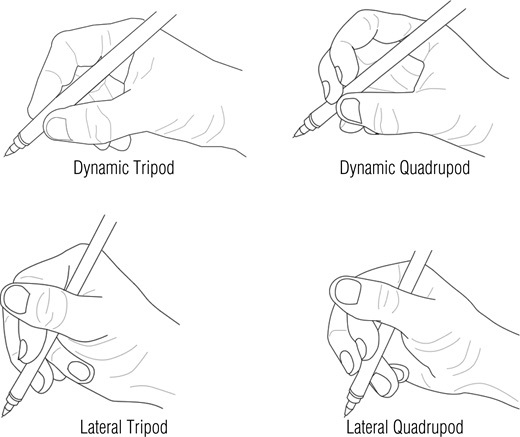 I seem to have a hybrid grip, where I'm only using three fingers like the dynamic tri, but using my middle finger like the quad. Losing my index finger might not affect my writing at all as it floats. As far as college goes, I expect your major would have a notable impact on how important writing is. I was Math-Computer Science/Physics, and mostly typed on a laptop for notes. Actual paper I'd do straight printing rather than writing; slower but easily legible and nobody cared that I could tell. You'll need to make sure you can at least maintain a decent duty cycle of writing/thinking over a 3 hour exam, but surely most day to day things can be done on a keyboard these days? Wow, i can write ln 'lateral tripod' for a loooong time comfy. sometimes 'dynamic quad". I know that everyone says the 'dynamic tri' is 'correct' but it was never comfy, it makes my wrist hurt in under 5 min. I will say my grip depends on what 'font' i am writing in. Neat printing is lateral tripod, cursive is more dynamic quad, big sweeping lines I do use dynamic tri like for fancy lettering work. Do they allow computers to type on for the test? I took act before that was added, but for GRE we took it on computers.